Lahore has seen attacks against Christians in the past such as in 2013. (File Photo). 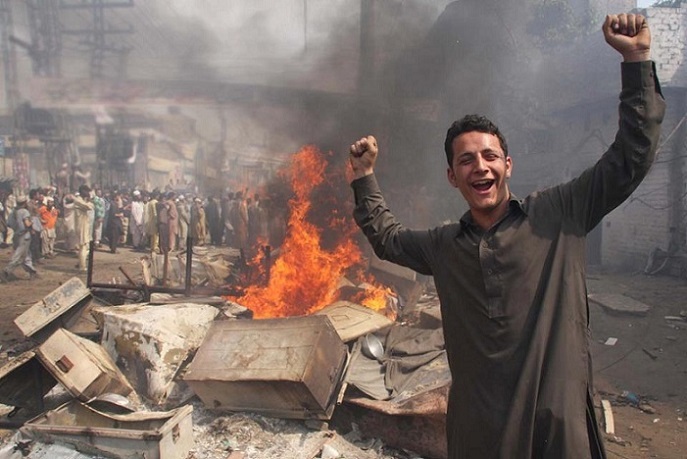 LAHORE, PAKISTAN (BosNewsLife)-- Up to 1,000 Christian families have fled a Christian neighborhood in Lahore, Pakistan's second largest city, after a Muslim mob threatened to hang a Christian young man for posting "blasphemous content" on his Facebook website, several sources told BosNewsLife. Christians said the tensions began Monday, February 19, when an angry crowd demanded that Patras Masih "be publicly hanged to death" after he allegedly used Facebook to "disrespect the prophet, Muhammad." The mob reportedly set tires alight and blocked part of the Grand Trunk Road, the main artery in Lahore that connects the Metropol with other parts of the nation. Local Christians also said that people with long beards had gathered and demanded that Patras Masih be handed over to them or else they would set their houses on fire, having brought petrol for this purpose. Protesters eventually dispersed after the police registered the case and detained him, officials said. Sub-Inspector Haji Munir, leading the investigation, was quoted as saying that the Christian had been told by other members of his Facebook group to delete the post. The confrontation came a day after several men of Pashtun descent carrying a picture of him went to the family's home to search for him, said Patras Masih’s mother. Amid the turmoil up to 1,000 Christian families reportedly fled the Dhair neighborhood of Shahdara, a northern suburb of Lahore and many remained in hiding late Tuesday, February 20, BosNewsLife learned. "The Christians of the area are in fear as some extremists have threatened to attack Christian homes. But at the moment situation is under control and police are patrolling the town," said Sardar Mushtaq Gill, a prominent Christian rights lawyer, and activist. They told reporters that they had agreed that Christians "would not interfere in the religious matters of Muslims" any further and that they will respect the religion of Muslims as well as their "holy places and their religious festivals." The case has underscored broader concern about Pakistan's blasphemy legislation, said Gill. "Recently a complaint under blasphemy accusations was filed against two daughters of late Asma Jahangir, a renowned lawyer and human rights activist," he told BosNewsLife. Blasphemy is a sensitive issue in Pakistan, and those accused of it have become an easy target for religiously motivated extremists," he explained. Young Christians are under pressure to watch their words on social media. Gill, who fled after death threats, suggested that the blasphemy legislation has attributed to an atmosphere of hatred towards Christians and other minorities. An "enraged mob can kill and burn alive anyone accused of blasphemy. These laws should be repealed to save the public at large particularly religious minorities in Pakistan," added Gill. He also said that Asia Bibi, a mother of five, must be released. Bibi, 48, has been in prison since 2009 after she reportedly told Muslim co-workers that Jesus Christ is alive while working in the fields for a Muslim landowner, according to investigators. Gill fears that supporters of Mumtaz Hussain Qadri, who was executed by hanging for murdering a governor of Punjab province, will fulfill their pledge "to kill Bibi if she is acquitted and released from jail." Governor Salman Taseer was shot and killed in 2011 after campaigning against the blasphemy legislation and calling for Asia Bibi's release. In that same year, shooters killed Pakistan's Minister for Minorities Shahbaz Bhatti, a Christian, who also publicly challenged the blasphemy laws and demanded more rights for minority Christians in the mainly Islamic nation.